Radek Andrle lives and work in Prague, Czech Republic. He graduated from the Private Vocational School of Art Design where he studied sculpture. He intended to continue his studies at the Academy of Arts, Architecture and Design in Prague. 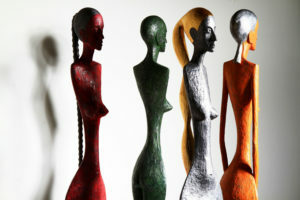 However, he was offered the opportunity of working as a specialist sculptor assistant in the studio of one of Czech’s leading contemporary sculptors and designers and he decided to take this unique opportunity to further his development and skills. Along with his own projects, creating sculptures and other pieces, he worked there for almost 14 years, gaining a wealth of knowledge and honing his practical experience in the process. Since 2011, he has been working on his own as a freelance sculptor. 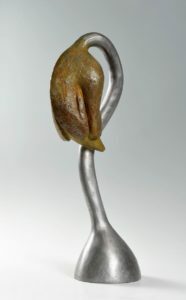 Andrle is fascinated by the idea of conception and the beginning of life, a theme which is evident in his earlier work. His latest works have been mainly inspired by the beauty of the human form. He has been always intrigued by the fact that we are all the same and yet so different and unique. He has attempted to capture this in his Femme Fatale series. He also specialises in large scale sculptures which are mostly displayed at exterior venues. He does not sketch his work and models his sculptures straight from clay. This method gives him an opportunity to create a piece from scratch, a shape he can feel and bring to life. He considers that by using this technique he can mould the sculpture to his idea of its desired perfection. He finds this method more personal and almost intimate, as he can feel how the material changes and forms under his hands; at the same time he draws inspiration from this process. There are not many artists who work with tin, but Andrle loves this material as it allows him to create an accurate imprint of his model and even the smallest detail is captured. Tin is easy to smelt and it enables him to use very vibrant and rich colours. He loves experimenting with many different materials and has used wood, stone, metals, metal alloys plaster and cement in various pieces of work. As well as being an artist, he is also a craftsman who has a great understanding of many different materials, who knows how they behave and how to use their best potential and advantage to express himself. His latest work is one consisting of tin and an alloy of metals.